When times are imported from an electronic timer and at least one lane has 0.3 second difference or more between the pad and button times, that lane is highlighted in red. When that is the case, swimming rules (whether FINA, USA Swimming or NCAA) require you to review the differences and select whether to use the pad, button or watch time as the official time. If you have the Show Backups if Time Flagged box checked, a window will automatically open with these differences. Use the Prev. Heat and Next Heat buttons to navigate among the heats in the current event. If Autosave is checked, moving to another heat or closing the screen will automatically save any adjustments and accept default selections for unreviewed (red) lanes. If Autosave is not checked, then if you make adjustments or there are unreviewed lanes and you click one of these buttons, it will ask if you want to save your changes. Clicking No will discard the changes and leave unreviewed lanes as unreviewed. Failed Heat — Check this box if ALL the times are off due to something like a late start. It will automatically check Show Watch Times, because you MUST enter at least one watch time for every lane when you do this. It will use the Delta values from the watch times to calculate the suggested Adjusted times. Therefore make sure to first select Use P or Use B based on which is more accurate, then enter all the watch times so that TouchPad will compute the proper Delta and Adjusted values. Read more about Failed Heats. Show Watch Times — Check to view/enter manual watch times, up to three per lane. This is checked by default when not using a timing system. Columns with color coded times. LN — Lane of the selected heat. HP — Heat Placement relative to other swimmers based on the pad time. B1, B2, B3 — Buttons 1-3 times. Times are red if 0.3 second or more different from the pad time. W1, W2, W3* - Watch 1-3 times. These are the only times that may be edited. Official B — Average of all button times for each lane, color coded according to the on-screen legend. If there are two button times, it will calculate the average. If there are three button times, if two button times agree it will use that time; otherwise it will use the middle time (not necessarily B2). Be careful about the case where the backup time is slower than the pad time since this could be due to a simple late push of the button(s) on that lane. Official W* — Average of all watch times for each lane. Uses the sames rules as button times, but with no color coding. Pad/Primary — Touchpad time. Time is red if 0.3 seconds or more different from the button times, or when it is missing. Delta** — When it's a non-failed heat, the difference between Official Button and white Pad/Primary times. Blank when Pad times are red. When it is a Failed Heat, the difference between Official Watch and white Pad/Primary times, or in the case of a red pad time, the difference between Official W and Offical B times. Adjusted** — TouchPad add up all the "good" Delta times (those 0.29 seconds and less, shown as "Total of Differences" below the grid) and averages them (shown as "Average of Differences" below the grid). When a (red) Pad time is missing or differs by 0.3 seconds or more from an Official Button time, the Adjusted time is derived by subtracting the average Delta time from the Official B time. TeamUnify recommends selecting these Adjusted times by checking the Use checkbox. For a Failed Heat, make sure to enter at least one watch time per lane, as they are needed to calculate Adjusted times. When a (white) Pad time differs by less than 0.3 seconds from an Official Button time, the Adjusted time is derived by adding the average Delta time to the Pad time. TeamUnify recommends selecting these Adjusted pad times by checking the Use P checkbox. When a (red) Pad time differs by 0.3 seconds or more from an Official Button time, the Adjusted time is derived by adding the average Delta time to the Official B time. TeamUnify recommends selecting these Adjusted button times by checking the Use B or Use checkbox. *Only appears when Show Watch Times is checked. **Only appears when using Other rules, or when using FINA/USA rules and Failed Heat is checked. Selections and indicators of which time to use. Use B — When using FINA/USA rules (not shown for Other rules), check the box to use the Official Button time. When you do this, the heat/lane columns on the Enter Results screen change from red to green. This is automatically checked if the pad time is missing. When Failed Heat is checked, uses the Adjusted Official B time. Use — When using Other rules (not shown for FINA/USA rules), check the box to use the Adjusted time. When you do this, the heat/lane columns on the Enter Results screen change from red to green. This is automatically checked if the pad time is missing. The Selected column will show B even though it's technically using the Adjusted button time. Use P — Check the box to use the Pad/Primary time. When you do this, the heat/lane columns on the Enter Results screen change from red to blue. When Failed Heat is checked, uses the Adjusted Pad time. Use W* — Check the box to use the Official Watch time. When you do this, the heat/lane columns on the Enter Results screen change from red to green. MAN — Time was manually entered on the Enter Results screen. FB — Failed Heat, used Adjusted Official Button time. FP — Failed Heat, used Adjusted Pad/Primary time. Click Print (or click Preview first) to print the adjustment grid so that officials can look at the raw data that came in from the timers in order to make a final decision. Revert to Original Times — Replaces all adjusted times for the current heat with those that originally came from the buttons and timers. Red lanes will change back to UN and you will need to make the proper timing column selections again. If you entered watch times, it will ask if you want to clear them. Click Save after making any adjustments to the current heat and to accept unreviewed lane selections. If Autosave is checked, it will do this automatically when you click Prev. Heat, Next Heat, or close the form. After the meet you can generate a Modified Results report to see all times that were modified from their original pad times. On the main screen click Meet Reports, select Modified Results on the left, and then click Print/Preview. Note that this report will show EVERY time that was modified, even those with less than a 0.3 second difference. 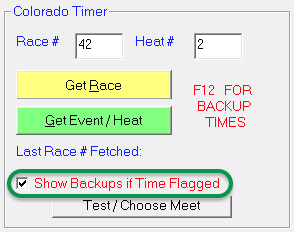 The Original column will be blank if there is no pad time, or if someone modified a time and the pad/backup times difference is less than 0.3 second. Otherwise there was a 0.3 second violation and you will see one of these possible values indicating what was done with it. Un-Reviewed - Appears if there is a 0.3 second or greater difference between Pad and Button times and one has not been selected. Failed (Pad) - Adjusted Pad time used in a failed heat. Off. But. - Official Button time used. F - Adjusted Official Button time used in a failed heat. W - Official Watch time used. See these links for additional reference.